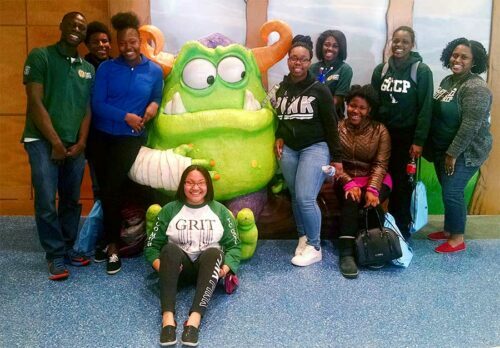 During their April Spring Break, eight students from Gary Comer College Prep’s National Honor Society chose to embark on a service learning trip to Comer Children’s Hospital. In the spirit of service, Gary Comer College Prep’s NHS requested that the hospital “allow our community to serve the needs of your community." What unfolded was a remarkable day of gratitude and “pay it forward” service that is best captured by the thank you letter sent by the NHS to the hospital. We are extremely proud of these talented, enthusiastic and caring High School Juniors and Seniors. It will be rewarding to watch these young adults as they serve as service ambassadors in Greater Grand Crossing, in college, and in their future communities. On behalf of the Gary Comer College Prep’s National Honor Society, I would like to send my most sincere and immeasurable gratitude for hosting us. The engineering of the whole service learning trip — providing us, a group of high school students, the time, space, and environment to do something meaningful and of service to the community and continuing the legacy of social justice upheld by Mr. Comer — even though it was difficult, it was worth it. The sense of self-development, awareness, and internal growth received is incomparable to any other service learning trip. GCCP National Honor Society Members at Comer Children's Hospital. Pictured from left to right are students Oluseyi Olaleye; Gerry Tucker; Ashlee Winston; Ernaja Coleman; Meiyia Black; Alex Scott; A’janae Williams; Deja Edwards and Ms. Wong (GCCP Teacher). “I will remember that there is art to medicine, as well as science and that warmth, sympathy, and understanding outweigh the surgeon’s knife and chemist drug.” This quote said by Hippocrates centuries ago still holds merit still today. Comer [Children's] Hospital embodies every facet of this quote. There is an unparalleled pulsating sense of empathy, sympathy, and understanding at the hospital; an idea of wanting to be more than an isolated institution and in being a pervading figure in the community. This is highlighted by renovation of the hospital, rooms, Remoc, and hanging art — some made by the children — in order to make the kids and parents comfortable. The Hospital is detail-oriented in order to make whatever difficulties the family and patients are undergoing in more to make them happier. More importantly, the sense of empathy and understanding is highlighted by giving us — National Honor Society — the opportunity to give back through awareness and action. The tour of the Hospital gave us a better and holistic image of Gary Comer the philanthropist. This sense of awareness has given more meaning to our endeavors to emulate the humanitarianism of Mr. Comer. Plus, the opportunity to continue to uphold his living legacy by doing something as little yet palpitating with meaning such as creating bingo sheets and making coloring packets means so much more than words can articulate."